The Spiral Bike Rack features an innovative twist on a traditional design. 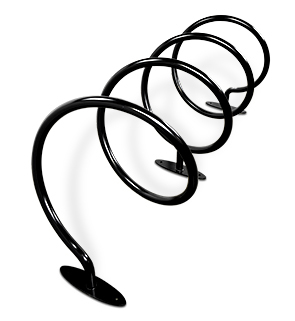 The Spiral Rack rests on three legs, slightly elevating the rack. It comfortably allows 8 bikes to be parked and safely secured. Constructed out of durable steel, these Spiral bike racks have a modern, lightly brushed stainless or black river powder-coating finish that will ensure a long lifespan and the ability to withstand weather conditions. They also feature elongated oval flanges that assist in providing ultimate support and ease the installation process. These flanges are sealed completely to prevent any unwanted creatures or moisture from getting inside the tubing. 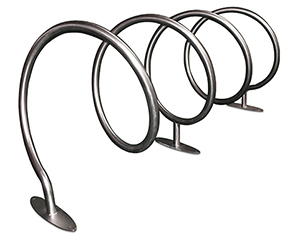 These imported steel spiral bike racks will enhance the look of any area with a modern design and convenient bike parking.